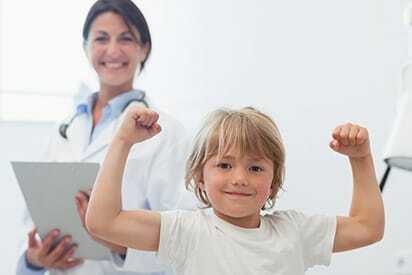 The Comprehensive Neurofibromatosis Clinic at Children’s Hospital Los Angeles specializes in providing multi-disciplinary medical care to individuals living with Neurofibromatosis type 1 (NF1), Neurofibromatosis type 2 (NF2) and Schwannomatosis. Our team works with patients and their families to establish new NF and Schwannomatosis diagnoses and offers follow-up care as well as genetic counseling services. Experienced physicians in multiple sub-specialty areas work together to coordinate patient care and provide a comprehensive treatment plan to meet each patient’s individual medical needs. Our Comprehensive Neurofibromatosis Clinic partners with the Children’s Tumor Foundation (CTF) and is part of an important network of NF clinics across the country that strive to provide excellent medical care to individuals with NF. The CTF is a nonprofit organization based in New York that promotes NF education and research. Our clinic works very closely with the local Los Angeles CTF chapter to provide an annual family educational NF symposium and other NF-related activities. Children’s Hospital Los Angeles is a member of the U.S. Army Department of Defense NF Consortium, which runs multi-center clinical trials for a variety of medical complications associated with NF1 and NF2. CHLA is the only United States West Coast NF Consortium site and provides interested individuals with access to the most current NF research and clinical trial studies. Our Comprehensive Neurofibromatosis Clinic was established in 2005 and is run jointly by the divisions of Neurology and Medical Genetics . Patients can be referred to either department and will receive the same services. Once evaluated by either Dr. Tena Rosser (Neurology) or Dr. Linda Randolph (Medical Genetics), referrals to other departments can be made as necessary depending on a patient’s individual needs. Physicians with NF expertise in multiple specialty areas help provide integrated care to individuals with NF1, NF2 and Schwannomatosis. Patients can be referred to either the Division of Neurology or Division of Medical Genetics.